A painted lady opens its wings to reveal its characteristic pattern. They are a particularly tough species, able to flourish even when other insect populations are in decline. // Image by Ifran Khan for Los Angeles Times. If you walked through campus last week, you might have noticed hundreds of orange butterflies that dart and bop and skitter past the Hub, kiss their shadows on the sidewalk, and swoop around the Cube before climbing the air over Kravis. The perfect backdrop for existential musings-- where are they from and where are they going? More fundamentally, what are they? “Painted ladies,” says Pomona Biology Professor Johnathan C. Wright. The British accent is so natural that the words can never be said in another way. Professor Wright contributed to butterfly census work in the UK, and has done butterfly projects in Bernard Field Station since coming to Claremont 20 years ago. He said that Vanessa cardui are perhaps the most widespread butterfly in the world, and he saw them even when he was growing up in England. These guys are migrating north from deserts in Mexico and Southern California as they do every year, but having this many is rare. In fact, Professor Wright said there has been a terrible decline of butterflies globally. “The decline is due to increased pesticide use, grubbing out of native grasslands and old pastures with lots of wildflowers, and also drought and peculiar weather probably linked to climate change,” he said. But painted ladies have several advantages over local California butterflies. The high rains in Southern California this year have led to a population boom, since the plants the larvae depend on have flourished early this year. They are breeding as they follow the blooms north, and can sometimes reach all the way to Alaska. There hasn’t been a painted lady migration on this scale since 2005. Keck Science Professor of Biology Diane Thomson remembers driving back from Anza Borrego then. How many butterflies have been flying through Claremont this year? It’s difficult to tell exactly, but Professor Wright and I did the math. Professor Wright counted one butterfly a second flying over his head when viewing a 10-meter range. He first saw the butterflies ten days before we spoke. 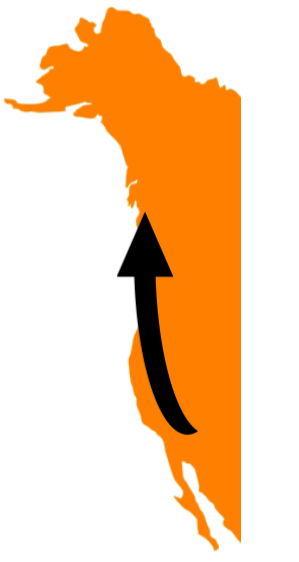 On the West Coast, painted ladies follow a narrow migration route up to Canada. On really good years, they might make it all the way up to Alaska. “If it’s a hundred-mile band of them going north, 100 times that would be 10 kilometers, 1000 times that would be 100 kilometers-” he’s doing these calculations too fast for me to keep up, but there are around 160 kilometers in a 100 miles — that’s where this estimate comes from. “So it could be over a thousand times the volume at any one time that I am counting, then extrapolated for however many seconds there are in a day-” he reaches for his phone. “Eight-six-four-hundred seconds in a day,” I offer (Turn it all around or throw it all away). Birds that eat these butterflies are probably very satiated. So is Ravi Sadhu ‘19, who wrote his senior thesis on bird species that mate in the spring. He said that the butterfly migration was a beautiful thing to watch. Kandace Fung ‘19 wasn’t as excited about the butterflies as Sadhu. “I thought they were moths,” she said. “My classmate was biking and was hit in the face.” But something changed once she found out they were butterflies, and she agreed that it was beautiful. Once the flowers start withering in the summer, the butterflies migrate back down to their breeding homes in the southwestern deserts. Since the reverse migration route is more dispersed, we don’t see them in the same numbers. But in England, the reverse migration of painted ladies has been a paradox for centuries, Professor Wright said. For Professor Wright, this trip seems futile. Maybe the journey doesn’t make evolutionary sense, but there is something to be said about a one-way ticket. Spring Break means graduation is looming ever closer, and I’m struck with an apprehension of all to come. The magnificent painted ladies migration is a reminder and an assurance: we’re all just passing through Claremont.